After dropping her son and daughter off at relatives in Wishek, North Dakota, in 1993, Kristin Diede vanished with her friend Robert Anderson. ND investigators suspect foul play. First broadcast almost 20 years ago to this day, this seems to be the only TV news coverage of this case. 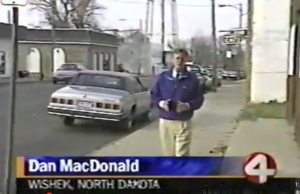 Broadcast in October 0f 1995 by WCCO TV in Minnesota. Click the > Play button. There are a few seconds of static before the video starts. After seeing this video & recently retiring from the Oregon State Hospital. I worked with many murderers. Really ? The ex-husband & his family know what happened to these people. Their bodies are most likely on their property. So sad for the children that they were most likely raised by their mothers killer / s.
This should have been solved years ago. Next Next post: Local business post Bob and Kristin missing persons flyer.